I can't beleive there's only 7 more days until Stamp Club. It's still not too late to sign up. There are two spots available. Call or email me if you're not signed up and would like to be. Here are 3 of the 4 cards we'll be making. 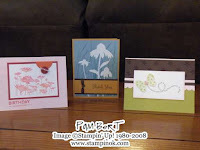 The 4th card will be made using the new Stampin' Up! Big Shot.